All prints come mounted for stability. Desk portraits (5x7s and 8x10s) are mounted on matboard. Wall portraits are mounted on styrene or masonite. For a ready-to-hang options, standout mounting or fine art canvas gallery wraps are available. Check here for pricing. matboard • A heavyweight, dry mount board. styrene board • Styrene is a plastic mounting board 2mm thick. Standard color is white. masonite • Standard 1/8” hardboard masonite. This traditional mounting surface provides a heavy duty, rigid, hard and long lasting substrate. standout • Standout is a thick lightweight board finished with a black plastic edge. Hanging holes on backside. Nothing extra needs to be done to prepare for display. Please note, delivery times can be longer than normal with this product. Fine Art Gallery Wrap • Your image is printed larger than the final size, and the print is then wrapped around a thick wooden stretcher bar. Staples are on the back of the bar. Framing paper covers up the back of the bars, and metal hangers and bumpers are applied to the corners. The Gallery Wrap is ready to hang with no additional work needed. All Gallery Wraps are protected with a special laminate designed for canvas prints. Your Gallery Wrap will be protected from scuffs and scratches, and the laminate offers UV protection. 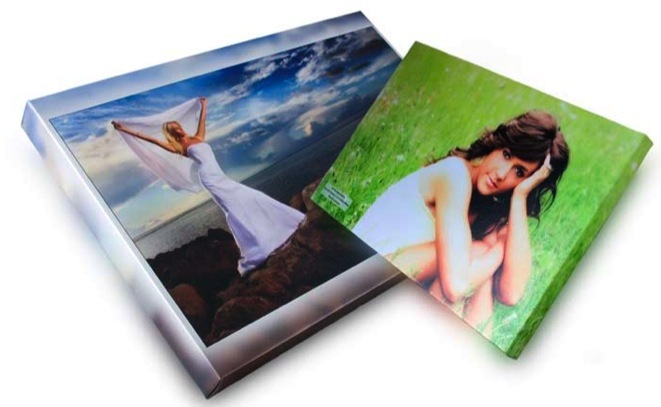 Lamination is included in the price of a Gallery Wrap and is available with either a Matte or Glossy finish.